Lewis Hamilton won the Chinese Grand Prix for the second year in running while Nico Rosberg finished second and Sebastian Vettel was third. Kimi Raikonend and Mass makes up the top 5. Race results and short review is available below. 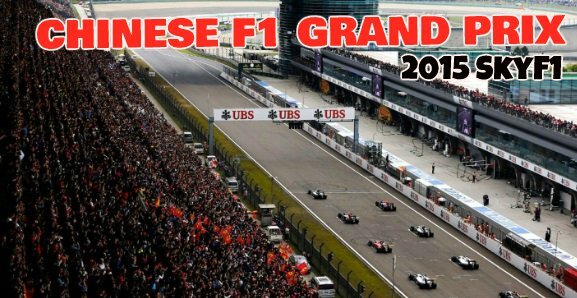 In what was a very exciting Chinese grand prix Lewis Hamilton started in the pole position and went on to win the race holding off challenge from his teammate Nico Rosberg (albeit controversially) to win his second straight China grand prix in two years. Nico Rosberg is getting frustrated by the race already this season and his frustration was evident during team radio talk in qualifying and he might feel he is over done by Lewis Hamilton in the race. Formula 1 Streaming Online free here. 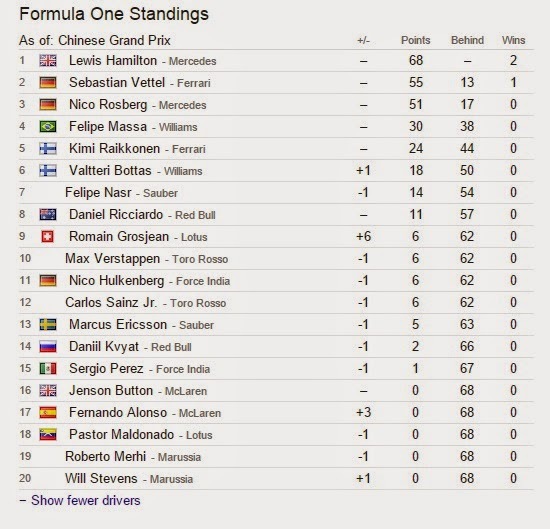 Here is the complete results from Chinese Grand Prix and what does this meant to the overall drivers standings after the three races in the season. We already had two great grand prixs this season with Lewis Hamilton beating of the challenge from Nico Rosberg and Vettel in the Australia Grand Prix while Sebastian Vettel winning his first grand prix of the season with Ferrari in Malaysia couple of weeks ago. Vettel’s win has kind of thrown out all the predictions and it looks like Ferrari are back challenging for the title this season. 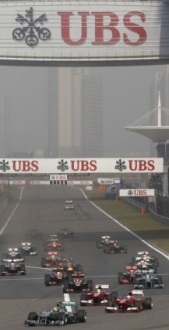 Next Grand Prix will be taking place in China come this weekend and the coverage starts on Friday 10 April 2015. Shenghai circuit has fast become host to some of the most exciting races in recent years and it provide fast corners and loads of overtaking opportunities throughout the smooth circuit and 2015 Chinese Grand Prix is promising to be another classic with Lewis Hamilton hoping to repeat his 2014 success here. Most of the teams will be looking to go with softer, medium & medium tyre strategy in two pit stops just like Lewis Hamilton won the race last year. The weather in China is much cooler compare to Malaysia and the circuit is quite big while more than 75% of the track is spent by drivers on the fast and low speed corners which means alot of pressure on the tyres while drivers accelerate on the corners constantly. So tyre strategy is somthing which might turn out to be a deciding factor for the top 3 spots. The first practice session will get underway this Friday morning 10 April 2015 at around 03:00 AM Uk time while the second practice session will take place at 07:00 AM UK time. 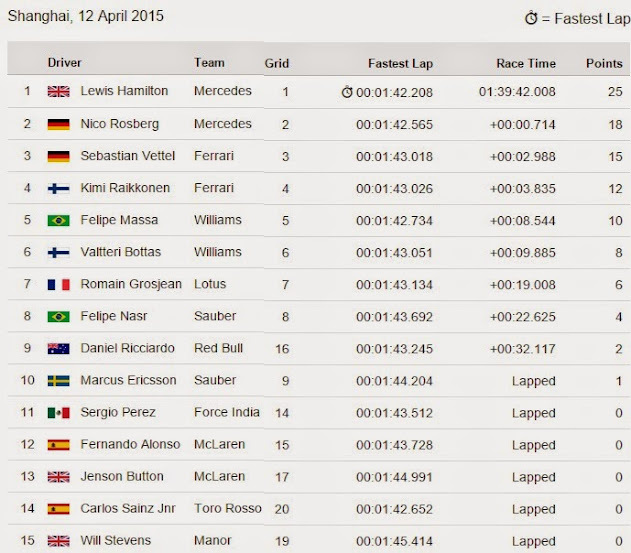 Here is the full schedule and time table for the Chinese Grand Prix.